If you’re anything like us, you’d take your furry friend just about everywhere with you. Sadly, the world we live in rarely allows such actions. Sometimes your pets must be left behind. While this is fine while you’re away at work for the day, it can be problematic when you travel. The stress of your upcoming journey combined with the hassle of leaving your pet with someone else can make travel more worrisome than it needs to be. But don’t fret! 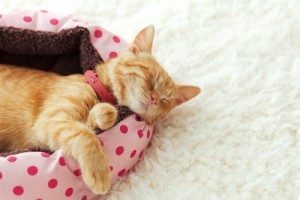 Nearly every pet owner feels a similar level of anxiety when using an overnight pet sitting service for the first time. Contact Information: It’s imperative your pet sitting service can get in touch with you in case of an emergency, so include your cell phone number. Giving the in-house pet sitting service access to a neighbor’s information and a close friend or family member’s contacts is also important. In an emergency situation, a pet sitter may need additional help. Travel Plans: Include the times and dates of your travels such as flight arrivals and departures of each destination and hotel information. Vet Information: Make the name, phone number, email, website, and address of your veterinarian available. A signed consent form giving your caretaker the right to take your animal to the vet is also needed. House Basics: Remember, taking care of pets means taking care of your home, as well. Inform your pet sitter of trash days, recycling pick-ups, and security codes. Also, leave a set of house keys. Feeding Instructions: From meal times to food type to portion control – every little detail needs to be included. Your furry friend can be finicky if not fed how he or she is used to. Medications: Make sure to include any information about medications your animal may take, as well. Allergy medicines are the most common item pet owners forget about when leaving for vacation. Pet Care: List where you keep the brush and leash. You may also suggest the best routes for walks or nearby parks. Also mention areas to avoid in your neighborhood. Play Habits: Remind your pet sitting service where your pet’s toys are kept. Your furry friends’ favorite toys may comfort them while you’re away. Rules: If you have rules for your pet, like not being able to sit on the couch, or no “people” food, then it’s important to inform you pet sitter. You don’t want your furball having a free-for-all while you are on the beach. Visitors: If a maid, electrician, gardener, or someone else is expected to show up while you’re gone, make sure to let your caretaker know. Unexpected guests may create a scare for in-home pet sitting services. If you’re looking for a licensed, insured, and bonded overnight pet sitting service in Virginia, please get in touch. Ensuring furballs have fun and stay safe throughout the Virginia communities of Manassas, Centreville, Clifton, Fairfax, Fairfax Station, and Chantilly is what we do! Here at Paw Pals, we look forward to loving your pet like one of our own.